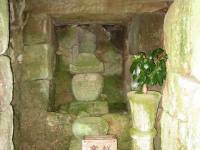 The temple is said to about 1300 years old! The legend want that as the ascetics were practicing secret ritual under the falls, the Immovable (Acala, Fudo Myo-o in Japanese) appeared riding a red eyed cow. From this time on, this became a place for the worship of Acala, the Immovable. No need to say that this place became since a high place of Buddhism in Japan. 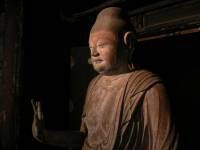 The famous Daishi Aoyama carved those rock Buddhas in natural stone and the legend say that he did it overnight! 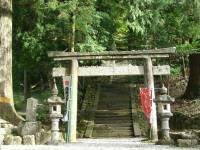 It has been worshiped by travelers passing beyond Aoyama Pass for centuries. the Stone Buddhas are made of two-body and are lined. Both have been enshrined in the national road 165 Route. The temple was founded 850 years ago by a great teacher of Buddhism. It is said that the statue of Bodhisattva with the 11 faces has been created by the Prince Shotoku. 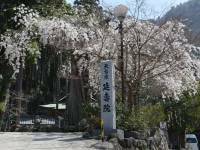 You can also admire a 900 years old Cherry tree (Chitoshi) which is protected as a Natural monument. There is lighting up during the blossom period. 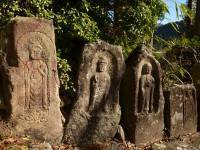 The graveyard on the west of the temple is the home to some beautiful (cultural assets) stone Buddhas. Around the Amutabha statue are placed some other stone Buddhas of about 70cm and another bigger one of about 100cm. 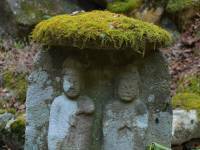 Those statues are believed to have been produced in the nearby village using volcanic stone "Obara". This is a temple constructed at the foot of the Kaiba mountain, on a quite place. It has been erected by Prince Shotoku. In automn you can see the leaves of the Ginkgo tree becoming yellow. This place is known for a special variety which has a leaf just over the beans. 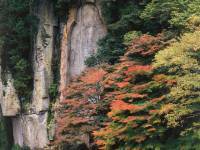 Muroji Temple has been created by the Ascetics who were training in the moutains. It is particularly remarkable because at this time Temples access was forbidden to women. The holy land start when you cross the red bridge! The stairway to the pagoda is made of 700 stone steps! There used to be a big Temple here, but after the death of the last monk in 1872 the temple started to become abandoned, and now there is only one part remained, the Zaodou, which hosts a 55cm Buddha statue. Onodera Temple is a small temple located right on the road from Muroguchi-ono train station to Muro-ji temple. The highlight is a 4 meter tall Buddha image carving, carved into the mountainside, located across the river from the temple and visible from the road. Further downstream is the site of another small image also carved into the mountainside. Can be visited on the way to Muro-ji Temple. This temple hosts a Murojidai period Kannon statue. The temple itself is dated to 670. This placed protect a 1000 years old japanese elm tree, which trunk is more than 6 meters wide!